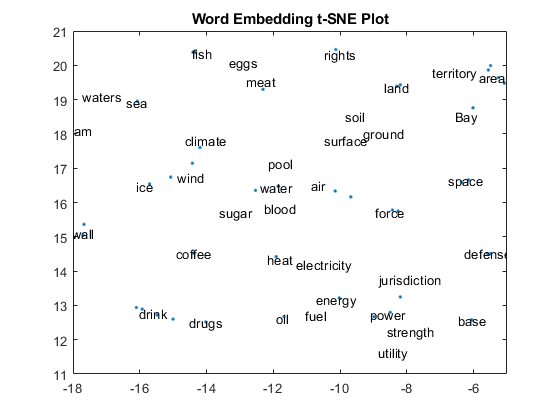 Word embeddings map words in a vocabulary to real vectors. The vectors attempt to capture the semantics of the words, so that similar words have similar vectors. Some embeddings also capture relationships between words like "Italy is to France as Rome is to Paris". In vector form, this relationship is Italy-Rome+Paris=France. 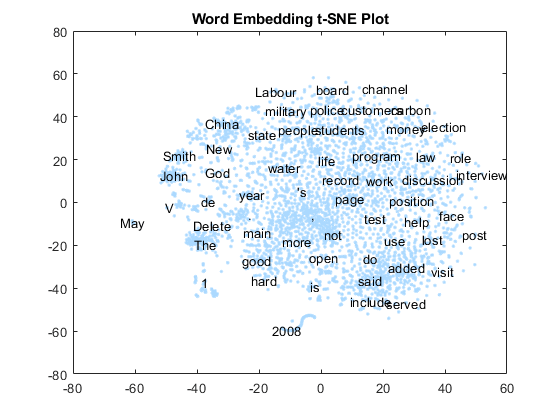 Explore the word embedding using word2vec and vec2word. Convert the words Italy, Rome, and Paris to vectors using word2vec. Compute the vector given by italy - rome + paris. This vector encapsulates the semantic meaning of the word Italy, without the semantics of the word Rome, and also includes the semantics of the word Paris. 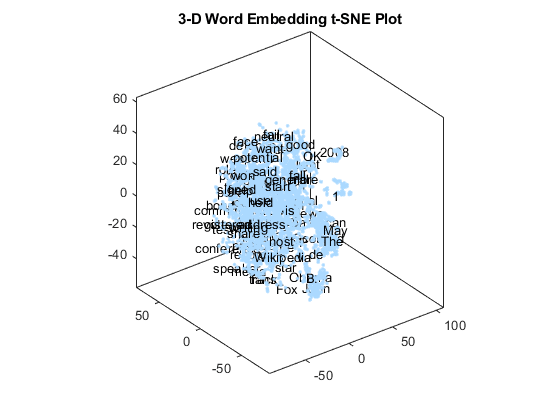 Find the closest words in the embedding to vec using vec2word. 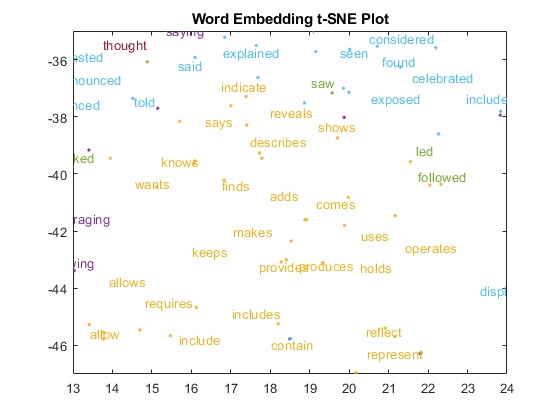 Visualize the word embedding by creating a 2-D text scatter plot using tsne and textscatter. 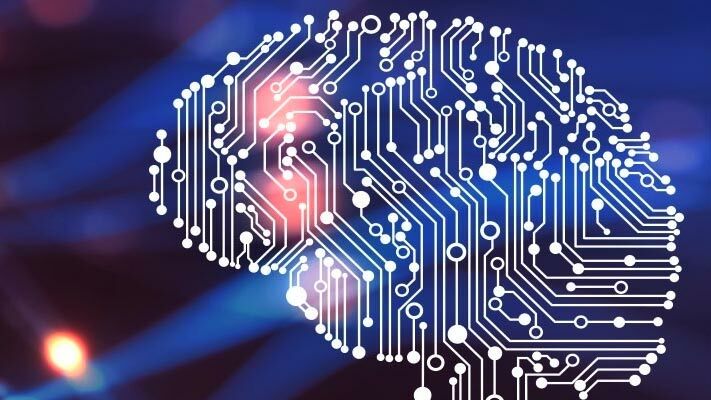 Convert the first 500 words to vectors using word2vec. V is a matrix of word vectors of length 300. 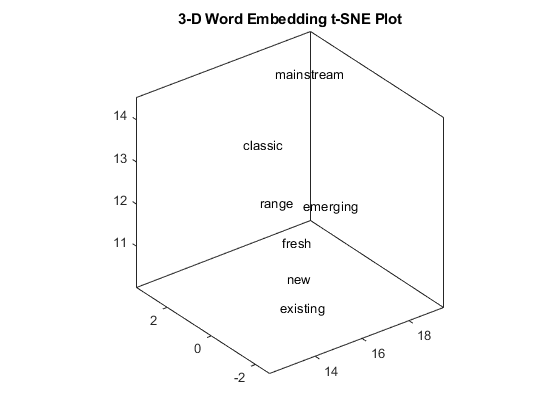 Embed the word vectors in two-dimensional space using tsne. This function may take a few minutes to run. If you want to display the convergence information, then set the 'Verbose' name-value pair to 1. Plot the words at the coordinates specified by XY in a 2-D text scatter plot. For readability, textscatter, by default, does not display all of the input words and displays markers instead. Zoom in on a section of the plot. 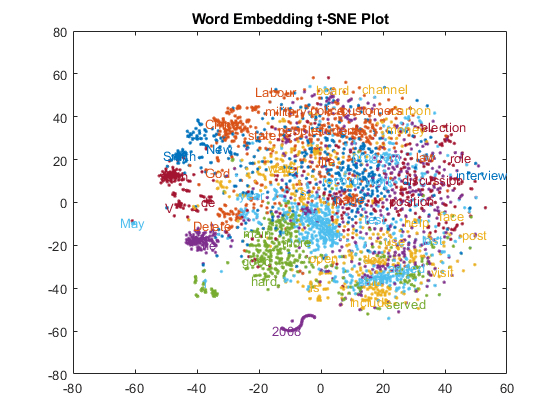 Visualize the word embedding by creating a 3-D text scatter plot using tsne and textscatter. Convert the first 5000 words to vectors using word2vec. V is a matrix of word vectors of length 300. Embed the word vectors in a three-dimensional space using tsne by specifying the number of dimensions to be three. This function may take a few minutes to run. If you want to display the convergence information, then you can set the 'Verbose' name-value pair to 1. Plot the words at the coordinates specified by XYZ in a 3-D text scatter plot. Discover 25 clusters using kmeans. Visualize the clusters in a text scatter plot using the 2-D t-SNE data coordinates calculated earlier.